Lisburn’s Parkview Special School and Hillsborough’s Beechlawn School recently took part in the MAC’s new MACtile programme. 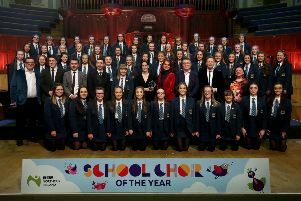 Over 350 children will take part in the programme, with the students from Beechlawn and Parkview among the first to experience the project at Belfast’s award-winning theatre venue. MACtile tours, also supported by Arts and Business and BBC Children in Need, is an initiative whereby specially-trained MAC staff travel to participating schools across Northern Ireland with its ‘Theatre in the Box’. The tactile box contains a replica model of the MAC theatre, along with samples of the costumes the cast will wear on stage, what lighting will look like inside the theatre and other visual aids to help the children gain an understanding of what to expect when they visit the MAC for the first time. Speaking about MACtile Tours, in the run-up to Christmas, the MAC’s learning and participation officer Clare Lawlor said: “From talking to teachers and parents, we discovered that the barriers to some children attending an arts performance can be huge, but with a relatively small amount of support, could be overcome. “We identified an opportunity to offer special provision to customers with additional needs and remove any element of fear or reservation about attending the theatre. “We know that many children will visit the theatre for the first-time ever this Christmas and we want to ensure that their visit becomes a happy memory that they’ll treasure for a long time. Following the ‘Theatre in a Box’ workshop, each school group was to visit the MAC over Christmas to attend one of the relaxed performances of Rumpelstiltskin, shows designed to welcome people with learning disabilities; Down’s Syndrome, Autism Spectrum Condition or sensory and communication disorders. There is a relaxed attitude to noise and movement and small alterations are made to the light and sound effects. Adding a special touch to each school visit, actors were to take time before the show to meet and greet the school children, reassuring them that they were just telling a story–while children were able to feel the costumes and so enhance the sensory experience of their visit. The accredited Autism Awareness staff were on hand for the whole visit with ear defenders, stress balls and other sensory aids to assist any children who might feel overwhelmed. The MAC was also to set up a ‘Chill out’ space for children who might need some quiet time to gather their thoughts.